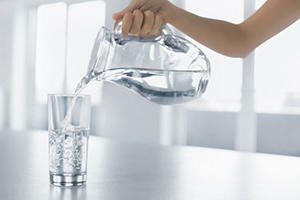 Authority Health › General Health › How Should I Regulate My Daily Water Intake? On average, the body of an adult human being contains 60% water, and throughout our day we are constantly losing water through functions like urine and sweat. Due to the varied water loss found in each individual, there are differing views on how much water we should be taking in daily. We have all heard the "recommended dosage" of eight 8-ounce glasses a day, which comes to about half a gallon, but there are other professionals who think differently. Many of these folks recommend that we carry water with us all day and constantly "sip" water, even when we're not thirsty. Ultimately, each person, unless affected by certain conditions, will decide on how much water is needed daily to keep healthy. Here are some areas with regard to water intake and how if affects the body and brain. There are many studies to support the claim that staying properly hydrated all day leads to better energy levels and brain function. One such study of women showed that those who lost at least 1.36% of their fluids during exercise were hit with mild mood and concentration reductions, while their frequency of headaches increased. Other studies too show that losing at least 1-3% of our fluids, which qualifies as "mild" dehydration, can affect other aspects of our brain function. Keep in mind too, that although it might seem tiny, losing 1-3% of our fluids, through exercise, heat, or other means, really is a significant amount, so one should always stay hydrated. 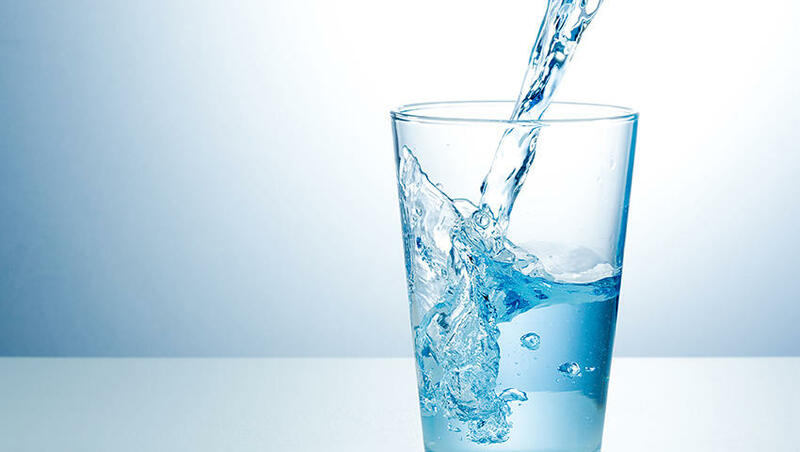 Will Increasing My Water Daily Water Intake Help Me Lose Weight? It is often proposed that drinking more water can lead to an increased metabolism and therefore a reduced appetite. There are actually two studies that support this, and according to both drinking 500 ml (17 oz.) of water can boost your metabolism, albeit temporarily, by as much as 24-30%. However, this effect will typically start to taper off after about 90 minutes. Other aspects of these studies showed that consumption of about 2 liters of water daily can lead to an increased energy expenditure of up to 96 calories on any given day. Drinking cold water is important too because the coldness of the water makes the body work harder to heat it, thus burning more calories. Also, having a nice glass of water about 30 minutes before eating will often lead to less caloric intake, especially in older folks. The results of these studies showed that people who faithfully drank the 500 ml of water daily lost 44% more weight over a 12 week period than those who didn't. Does Excess Water Ward Off More Complicated Health Issues? Studies show that an increased water intake can actually help when it comes to certain areas, including constipation, cancer, kidney stones and acne and skin hydration. The notion that drinking water helps with constipation has been around for ages, but it still holds true and there is a lot of evidence to back this up. Some studies have shown that drinking more water can result in a lower risk of bladder and colorectal cancer, but as a cautionary note, remember that there are other studies which have shown water has no effect at all. Increased water has also been reported to help with kidney stones. Do The Other Fluids I Drink Count? In a word, yes. In fact, there are hosts of other drinks and foods that contribute to our daily water intake levels. You may have actually heard the myths about beverages like coffee and tea not counting toward our daily total because the caffeine they contain acts as a diuretic, but you can toss these aside because the diuretic effects they have is so small it's not worth worrying about. Other foods that are typically included in our diets are loaded with water too, like meat, eggs, fish, and fruits and vegetables. A good rule of thumb is that if you are eating a balanced diet, your water balance is probably going to be fine. We need a good water balance to survive. Accordingly, our bodies are equipped with certain built-in mechanisms that tell us when and how much water we need to remain healthy. For the vast majority of people, these mechanisms work fine and are very reliable. However, there are instances when we need more water when we might not exactly be craving it. For example, if you've just worked out and sweated a lot, you need to replace the water you have lost. And in many cases, folks like endurance athletes will have to replace their electrolytes as well. Hot weather can have the same effect. That's why we're always hearing meteorologists tell us to "stay hydrated" during heat waves or the summer months. Increased water intake also plays a critical role in women who are breastfeeding, as well as, people suffering from chronic diarrhea or vomiting. Older people too may want to keep a closer watch on their water intake, as some studies have shown that thirst mechanisms can start to break down later in life. How Do I Know How Much Water Is Best For Me? In the grand scheme of things, you're going to be the best judge of that. Keep in mind that if you exercise regularly, you can increase the benefits to your workouts by taking a natural supplement and making sure to drink adequate amounts of water. You can experiment if you like, by increasing and decreasing your water intake proportionately to see if there are any real changes, but generally your built-in mechanism will always be your best barometer.